Like to keep an eye on stock prices? 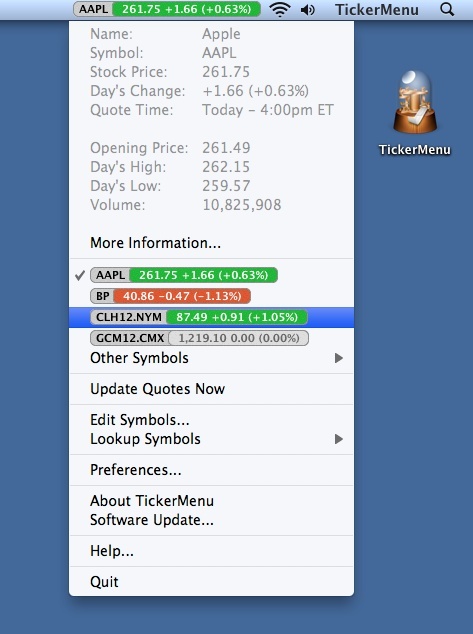 Make it easy: use TickerMenu 2.0 to track stock prices in your OS X menubar. 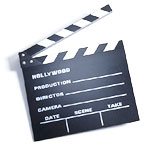 Just specify the stocks you want to follow and TickerMenu will update quotes at the interval you choose. TickerMenu 1 was a Featured Download and a Staff Pick at Apple Downloads. 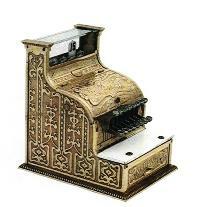 • Build a list of the stocks of interest to you. TickerMenu will keep current price information in your menubar and inside the menu. • Quotes are color-coded to reflect daily increases (green) or decreases (red) in price, but you can choose a greyscale appearance if you prefer. • Select the information to be displayed in your menubar and inside the menu: the stock's ticker symbol, its current price, its price change for the day and its percentage price change. • Click on the quote to see more information about your stock's trading activity, including the day's high, low and volume. • Choose "More Information" to jump directly to detailed information about your stock available from your choice of several popular financial websites. • TickerMenu is a Universal Binary application that is compatible with Mac OS 10.4 (Tiger), 10.5 (Leopard) and 10.6 (Snow Leopard). Apple Downloads is a property of Apple Inc.